Ok, I must admit that trying to maintain an online store is really hard to do if you have a hard time letting go of some sentimental value that I have placed on my collection.
.:: Junolyn's Store Update ::. Up for sale is a 2006 Pochacco (Teenager size?) Backpack with sling. I bought it at the sanrio store because I loved the color and the whole design concept - plus, it didn't scream little kiddies backpack. It was something that I would have used, but never did. Next up is a 2005 Keroppi Magnetic Photo Frame. It's brand new and has never been used, but cardboard box that comes with it is a little bit worn out at the edges due to years of storage. Sorry for only giving picture from the box. Got too lazy to take it out of it's inside wrapping contents (plastic + white holders)... but if you insist, give me a shout out. 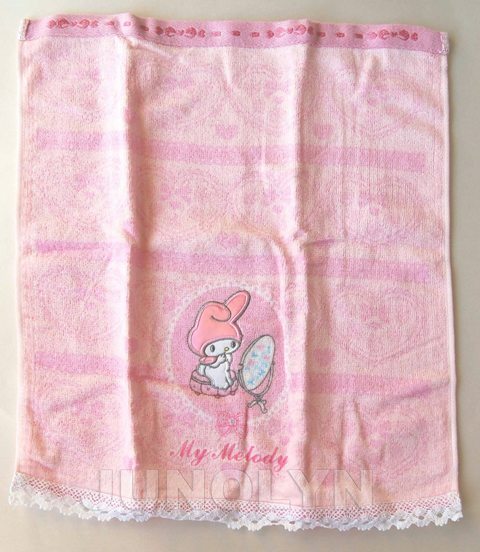 I bought this at a sanrio store in 2005 because it was so darn adorable. Especially since Keroppi is in his classic red and white stripe outfit. I love that Keroppi design classic look. I really wanted to use this, but I can't keep everything. Lastly, I have added a 2005 My Melody Towel cloth that was made by Vivitix, but sold through the Momoberry store back when it was still open in Los Angeles. This is my double copy that I am selling off, so I'm using my internet name watermark on this picture. If you would like more details regarding any of the pieces above, please visit my store's link on the left side.